Laser Welding Part - Mcm Stamping Co., Ltd. The laser welding is one of the feature services for surface treatment from MCM. You can apply this service for your metal parts or inquire our laser-welded metal part for different purpose. 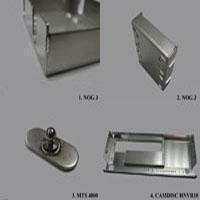 We provide three types of the metal parts, and you can refer details briefly as the table shown below. If you are interested in our products, please feel free and contact us for more. We also provide customize service; meanwhile, you don’t have to worry about the ordering number because the minimum order is negotiable. We look forward to your inquiry!